I had a natural gas futures trade all lined up, and it went almost exactly the way I had hoped and even shot up higher in less time than I expected. And yet, I made no money. In fact, I didn't even get a trade in. I had spotted the trade opportunity over the weekend, and in preparation I developed a mental plan and set my alarm for 5:00 am (my time). I had forecasted that I might see a low price point long entry opportunity somewhere around 5:30 to 6:30 (my time). As it happened, it went down just that way. Unfortunately for me, the low point in price wasn't low enough by about 0.02 for my mental plan to signal my trade. The result was that I did not enter a trade, and I missed out on nearly a 0.20 run. Observe this 60 minute futures trading chart for October natural gas futures. 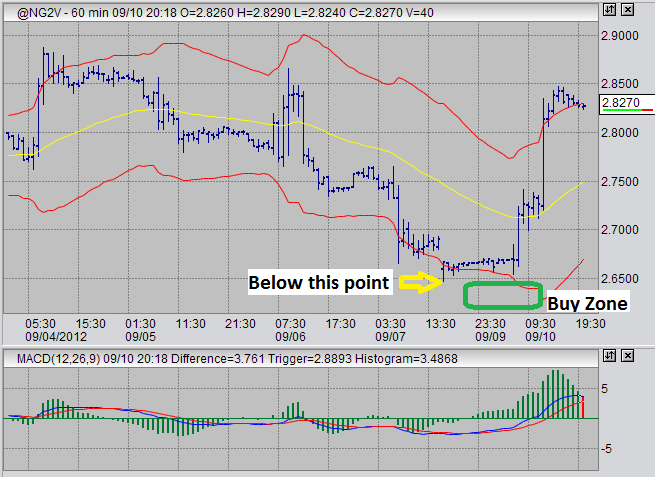 The yellow arrow indicates the point I wanted prices to cross below, before I could enter a long trade. That is, assuming that MACD behaved accordingly, which it did. MACD was set up very nicely for a 60 minute MACD divergence trade, but price did not co-operate. The zone I was looking for to buy is in the green box. As I watched during the early morning as prices just went up, I thought to myself "should I just buy?". NO! My plan didn't work, so I move on, oh well. Buying afterwards, even though it would have been profitable in this case, would have also been impulsive. Impulsiveness and trading don't mix, at least not for me. The situation that occurred today frustrated me, a little. There were times in the past, that it would have frustrated me A LOT. Now, I take these situations as lessons. Not lessons in trading, but rather lessons in self control and emotional stability. Chasing trades and higher/lower prices is no way to stay on the safe side of risk. Failing to enter what could have been a good trade, a good trade that went very closely to my plan, is an opportunity to hone my discipline and patience. On a side note, I should mention that when I trade natural gas futures, I always trade the e-miNY contracts for 2500 BTU's. I don't feel comfortable enough in this particular market to trade the full sized contracts, yet. Along with natural gas, gold, crude oil, and 10-year T-Notes are markets that I'm not terribly comfortable with, but I am making an effort to understand their technical behavior better. That being said, of those four, I am most comfortable with natural gas and gold. The markets I am most comfortable with are the US dollar index and sugar no.11. Speaking of which, I am still watching sugar with an eagle eye. I am anticipating a long entry very soon. It may not happen, but I am feeling like its coming up. The dollar index buy entry has continued to elude me. I am starting to think more and more that this market may find new lows and perhaps spend some time in a range in the upper 70's and low 80's until the US election at the beginning of November. Of course, this is purely wild speculation. I am continuing to watch both the USDX and sugar keenly for buying opportunities.